This is a relatively simple project.I designed my plans based on similar bed frames found on sites like Restoration Hardware and Pottery Barn. The first time, I made this on my own and it took me two afternoons to complete, including the upholstery. As you can see from some of my pictures we made a second frame for another room. Mr. Handy tested my plans to build the frame and we noticed it was missing some pictures to help guide someone who has never worked with wood. 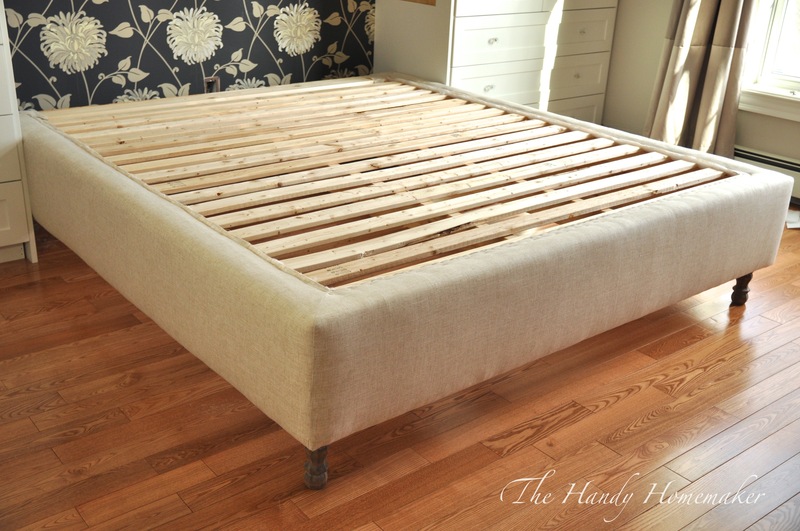 I hope the newly updated post helps you easily create the Restoration Hardware style bed-frame for a minimal cost. 🙂 Together Mr. H and I finished this project from start to finish in under one day… and we took lots of breaks 😉 I drew out a plan by using the measurements of my mattress and the upholstered headboard that I made 9 or 10 years ago. I planned out the wood I would need and figured in the finished height of the bed with mattress on. So here is how I did it. Use these plans and adjust as you need for your mattress size. Wood drill bit for pilot holes on ends. 1/8″ worked for the screws I used. Optional* Nail gun and compressor but really helps if you are making this by yourself to nail together in a couple of spots and then add screws and glue for strength. I built the bed-frame in the room where it was going to be placed. You might be thinking oh no your floors.. Don’t worry, I was careful even though they were being resanded and stained the next month. You should consider making this in your garage or protect your floor with cardboard to reduce scratches. Double check your ceiling and door height especially if your bedroom is on the second floor and you need to do stairs… You don’t want to make this and then it not fit. Use carpenter’s square to square up the ends of the wood, then measure, mark, and cut all of your wood. 2. Use a two of the 1x12x81″ pine boards, these are for the sides (stiles) and two of the 1x12x74″ pine boards, these are for the ends (rails) The rough finish pine boards is actually 1″ if you buy smooth finished board you will have to adjust the length of this cut to make up the difference for the width. 3. Place the boards together and using a nail gun, tack together with the sides (stiles) placed on the outside of the ends (rails). Once tacked secure for strength with 4 – 2″ -2.5″screws per corner. I pre-drilled my holes first to prevent splitting. If you are making this to be stained use the kreg jig if you have one to join the corners. 4. Next add two of the 1x4x79″pine boards to the sides. Use an extra scrap piece 1×4 on the floor in each inside corner rails (This is to allow for the 1×4 and the 1×3 straps to sit flush with the sides once flipped over. Place the 1x4x79″ on each side and glue, and screw in place with a 1 1/2″ wood screws every 6 -8 inches. 5. Add the 2x4x79″ to the inside, mark 28″ from the inside of the sides (stiles). Center the 2×4 to this mark. Again using the scrap 1×4″ to rest the 2×4 on while you screw in place. 6. Screw in place from the outside of the 1×12 into the end of the 2x4x79″ with three 2 1/2″ screws per end. 7. Use two pieces of 1x4x24″ across the center 2×4 supports, glue and screw in place. 8. Place the two 1x3x74″ and two 1x4x24″ boards horizontally across the middle and screw in place. This is to help the 2×4’s from twisting in the center. 9. Using the 2 pieces of 1×4 plus the metal corner bracket mark, mark the depth to make the bracket sit flush with the rails and stiles. 10. Make a level mark with your square. 11. Starting with the 2x4x10″ place it under the marked line tack in place followed by the 2x4x8″ to each corner. Tack in place under the line with a nail gun and 2″ brad nails. 12. Use glue and screw in place with the 2″ wood screws. Since I was upholstering, I added a few screws from the outside into the corner supports for added strength. ( I went a little overboard I think) 13. Add the 1x4x74″ lengthwise, place at the corners also along the outside edge of the 1x12x74″ (1 every 6-8″ is all that is needed.) I set the bracket in place when I placed the screws in the corners to ensure that they wouldn’t get in the way of the bracket screw holes. Close up to show how the corner is set to the correct depth to add the bracket for the leg. Okay we are almost finished… Ready for the Leg brackets. 14. Add the leg brackets to each corner with 2″ wood screws The screws that came with the brackets are not strong enough imo… 15. Center the bracket in the corner. 16. I marked the holes and then pre-drilled with a 1/8″ drill bit to prevent the wood from splitting. 20. I forgot to cut my slats on my cut list the first time. Place the 16 pre-cut 1x3x74″ evenly apart along the length of the bed frame. I did not get too perfect here. Nail in place. I screwed the centers but nailed the ends with a nail gun as they started to split as it is too close to the end of the wood. If you don’t have a nail gun you will need to pre-drill each hole on the ends. Finished and ready for Part 2 Upholstery. Keep following for the finished product with a post for a DIY Upholstered headboard. I just read your Blog on upholstered bed frame and looked at the ten steps,you are amazing you have so much talent I am in awe.You make beautiful decorated cakes and pastries also interior decorator and then turn your hand to carpentery,you are another Maratha Stewart. I love this. I am gonna try an have my husband build us one. This is just beautiful. Very talented! I love this post. It’s just what I was looking for. I’m curious though, how much did supplies cost you? just read your inspiring post on this upholstered bed frame. Is the finished size of the frame the exact size of the mattress? I was thinking of trying this in a twin size……. Yes, this bed is exact same size as my king mattress. Once the fabric is on they look pretty seamless (minus the corners if your mattress has curved edges) but it isn’t a noticeable difference. Just take the size of your twin mattress and reduce the measurement to accommodate that size mattress. Hope this helps. Wow! I really want to try this. I work at Home Depot so there is all kinds of cull wood that is usually 70% off, and since I’m going to upholster it it really doesn’t matter if it matches right? Do you have dimensions for Queen bed? Hi! I came across this post and want to try it. I recently found a beautiful king headboard that I am planning on purchasing. It already has holes. Would this frame also be able to be attached to a headboard like this? I am not sure what kind of hole placement it has. But you should be able to line it up, drill the holes and attached with Bolts, washers and nuts. Let me know how you make out. Wow, this is great! Are there any center support legs?